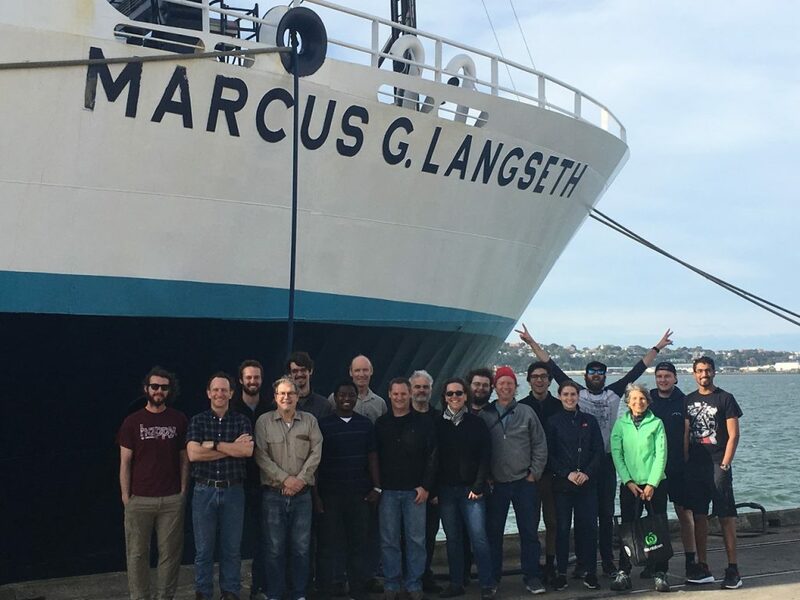 UTIG researchers and students Sean Gulick, Harm Van Avendonk, Brandon Shuck, Dominik Kardell, Steffen Saustrup, Marcy Davis and Dan Duncan just returned from their time aboard the R/V Marcus G. Langseth off the coast of New Zealand working on the South Island Subduction Initiation Experiment (SISIE). They sent us this update on their final two weeks on the cruise. Read their first update here. The entire 18 person science party back on stable land at the end of the experiment. Photo courtesy Sean Gulick. The final 2 weeks of SISIE were a great success despite the weather that the Southern Ocean continued to send our way. We successfully acquired multichannel seismic (MCS) profiles over both the two transects that we had earlier collected ocean bottom seismometer (OBS) data on, on a strike line down the center of the Solander Basin. We were excited to image underthrust of sediments and ocean crust on both seismic lines despite the youthfulness of this nascent subduction zone. 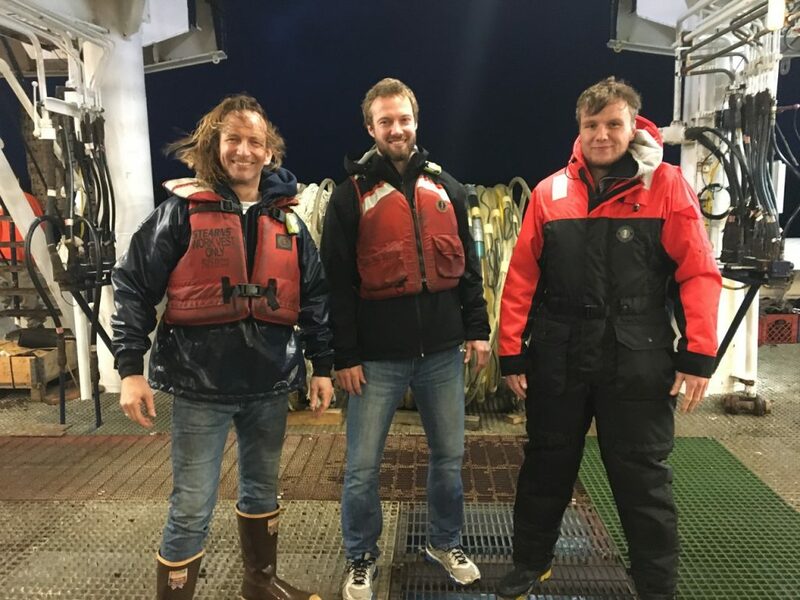 Due to a forecast for three impending back-to-back storms we decided to recover the 12.6 km hydrophone streamer and airgun strings and transit back to the northern part of the basin. There we deployed a set up that would be quicker to deploy and recover, including a 4 km streamer and different location for the other towed equipment. We acquired a portion of a profile linking our data from the Solander basin towards the grids of existing seismic and well control to the north near the South Island. However, the weather reached a state in which is was too rough to operate and we recovered the gear and took shelter behind Stewart Island. There we waited while two of the storms passed through over the next 5 days. Conducting operations on the streamer deck. Photo courtesy Sean Gulick. A break between the second and third storm allowed us to head back out, deploy and finish collecting the line that would tie our data in south with the well constrained basin near the South Island. This line was also critical as it shot to land instruments onshore that had been patiently wait for us to head their way. We collected one additional east-west line shooting to a second line of land instruments and recording some fascinating data over the Puysegur Bank before deciding the weather was worsening and it was time to recover our equipment. That was accomplished by Sunday night and we started our transit back to Dunedin happy to be in the shelter of the South Island for much of the transit to port. All in all we weathered 4 named typhoons and still succeeded in acquiring 1251 km of MCS data and another 500 km of OBS data with only a single instrument lost. A well-deserved end of cruise celebration was had at the local brewery near the ship and we have all started out travels back home. The R/V Langseth technicians and crew were outstanding throughout the cruise. Here is a bonus: a time lapse video during surveying!